Gang violence is a problem not just in America, but all over the world. It causes needless violence in the name of pride and is an antiquated territorial ideology. It needs to end. 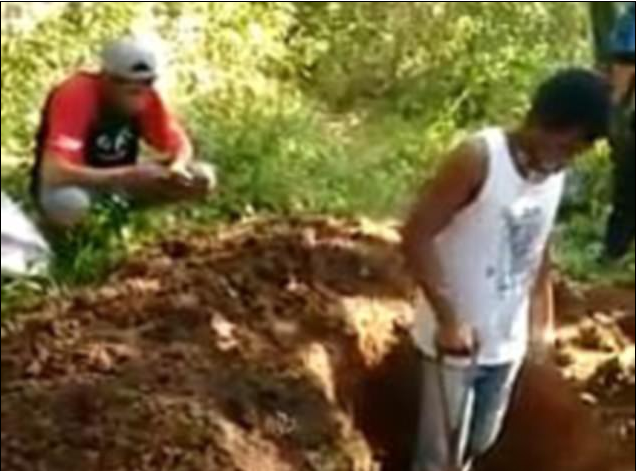 An example of this kind of crap happened in Brazil, where two cousins were forced to dig their own graves at gunpoint after being captured by a rival drug gang. There were at least four members of the gang there filming this on their phones. Disgusting. Wagnar de Rosa, 17, and his cousin Victor, 22, were captured by rival gang members and taken into a wooded area near Porto Alegre in Brazil. It was here that they were forced to dig their own graves while their kidnappers filmed their final moments. After finishing the grim task, they were shot repeatedly with rifles and then set on fire after being drenched in gasoline. While they were alleged to be gang members, police say that they didn’t have a criminal record or convictions of any kind. I’m going to post the video below, but all of the graphic bits have been cut out. Still, it may contain content that some viewers find to be disturbing. Please use discretion in viewing this clip. Police claim that an armed young man was arrested near the scene of the crime, but denied any involvement in the murder. It is being investigated by the Brazilian Civil Police. “Police are still investigating the crime and have not released the names of the gunmen. But we believe they are from a gang known as Anti-Bullet,” said Filipe Borba, an officer with the BCP. He also believes that the event was videoed as a warning to members of rival factions, showing that they have no sympathy and are willing to murder in the most brutal ways to ensure that they have control over the drug trade. Let’s hope the animals are found and brought to justice.